The licorice plant is a perennial plant which grows to around a meter in height. It grows in a number of countries in Asia including China, Pakistan, turkey, Turkmenistan and Iraq. Its root’s distinctive scent comes from its complex combination of chemical compounds. The long lasting tart sweet flavor of licorice owes much to the glycyrrhizin that it contains but apart from its uses in the food and candy industry, licorice also has a number of far reaching medicinal benefits ranging from emotional wellbeing to diabetes and heart disease. A healthy heart is vital for a healthy you so who does not want their heart to be as strong as possible? 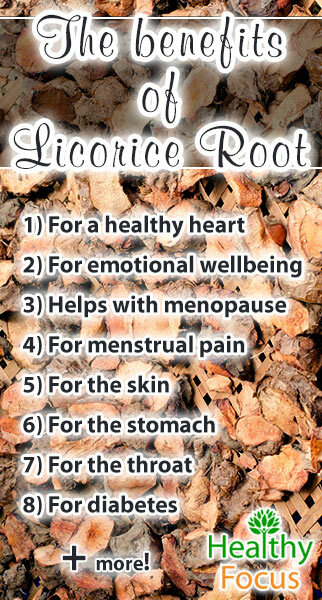 According to research, licorice root might help control cholesterol levels by promoting the flow of the body’s bile. The bile in our body is known to help eliminate excessive amounts of cholesterol from the body. And if that is not enough, licorice root has potent natural antioxidant properties that may well enhance vascular health by preventing the growth of plaque in the arteries. One of the main compounds contained in licorice root is a chemical called glycyrrizic acid and research suggests that this compound may be able to help you achieve an emotional balance. If you suffer from depression and anxiety and you have tried a variety of remedies, then it may be worth giving licorice root a shot. Of course there are no guarantees and if your condition is serious, you really need to speak to a medical expert but for mild forms of anxiety or depression, this is a natural and safe remedy and you have little to lose by trying it. Experts believe that it works by stimulating the adrenal glands which control human stress hormones such as cortisol. Anybody that has ever been the victim of stress knows that it can be extremely debilitating. Stress can also bring on a number of physical problems like fatigue as well as messing with your immune system. Another compound contained in licorice root called asparagine acid is vital to maintain the balance and healthy functioning of the nervous system. Women who are going through the menopause or have already done so will probably be familiar with all of the nasty symptoms that it causes. Mood swings, hot flushes and fatigue are among the many symptoms that women can expect to encounter. Licorice root has antioxidant and phytoestogenic properties that can help alleviate many or all of these unwanted symptoms and there are many positive testimonials online regarding the effect of licorice root supplementation. Most all women will be very familiar with the unwanted side effects of menstruation. These include tenderness of the breasts, painful cramping, bloating and nausea as well as emotional issues. If you suffer from one degree or another from any of these symptoms, then licorice root might be able to help. This is because licorice root has natural anti-inflammatory and antispasmodic properties as well as a mild estrogenic action that may help to alleviate many of the symptoms associated with menstruation. Supplementing with licorice root capsules or tea a few days prior to your period might be an effective and safe way to ease those symptoms. Licorice root can not only be eaten but it can be applied topically to help relieve a variety of skin conditions including rashes, psoriasis and eczema. It can also be used to help those with dry or itchy skin achieve a more healthy and balanced complexion. The many therapeutic properties of licorice root including its antioxidant and anti-inflammatory compounds can be put to good use on the skin. You can make your own skin salve or buy a ready-made treatment which includes licorice root among its ingredients and apply it to the affected areas twice or 3 times each day.. If you are suffering from a stomach upset or any number of mild digestive complaints, licorice root might have the answer for your problem. The flavonoids and natural anti-inflammatory properties that the root boasts can help ease discomfort and bloating and help promote a healthier digestive system. It is also possible that licorice root can help relieve constipation when ingested on a regular basis. 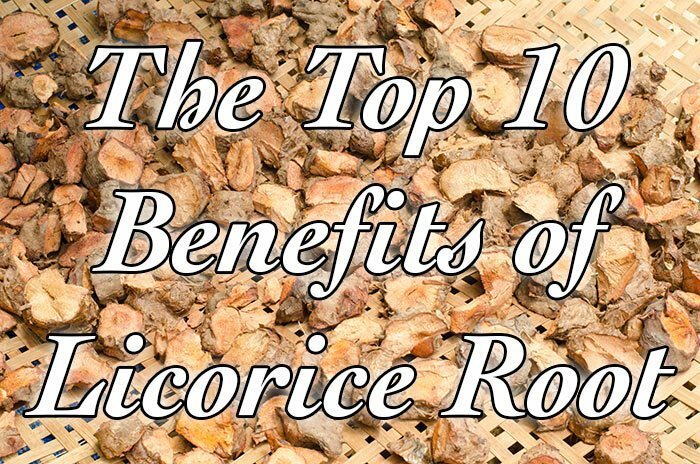 There are numerous ways to take licorice root but among the most effective for digestive complaints is to prepare a cup of licorice root several times a day and enjoy. While there is no evidence that it can work, there are many testimonials to be easily found regarding the effects of licorice root to soothe a sore throat. Like many herbal remedies, a cup of licorice tea might well help alleviate the pain in your throat and in any case, it is a safe option. There are no guarantees but try it and see. I can hear you sigh…yet another weight loss wonder food…and I don’t blame you. The market is littered with products that promise to help you lose weight fast and let’s face it few of them work. In reality this one might not work either but if you need to bust a few pounds, there is no harm in trying at least in the short term. There is small body of research that indicates the flavonoids in licorice root have a fat reducing hypoglycemic effect but the precise mechanisms are not fully understood. (2) If you are trying to lose weight, try incorporating licorice root into your weight loss plan which should include regular exercise and careful eating habits. There is some evidence though admittedly not much that licorice root may be able to help treat sores from the herpes simplex virus as well as shingles. Some experts have suggested that supplementing with licorice root might suppress and protect against the recurrence of herpes related cold sores and shingles. To treat these complaints either take a licorice root capsule twice a day or apply a topical salve made from licorice rot to the affected area several times daily for as long as necessary. READ What is Whey Protein and What are its Benefits? Like many herbal remedies, the fact that licorice root is natural does not mean that it should be taken without due care. Licorice root is considered safe when taken in relatively high doses or applied topically for a short period of time. However taking licorice root for longer than a month is possibly unsafe. Pregnant or lactating women are not advised to take licorice root.